History: At the end of each century the cult of the Coven tried to bring a Dark Age to Earth with the Tear of Heaven. (Marvel Comics Presents I#132/1 (fb) ) - The Coven hired Cyber to bring them the Tear of Heaven and the priestess Kayla. He brought them the gem, but he lost Kayla. He picked up her scent again and assassins were sent after her. (Marvel Comics Presents I#132/1) - Assassins of the Coven were hunting Kayla down the beach of Koma Koi. They wanted her back because she bore the sacrificial mark to make her the herald of the Dark Age. Wolverine stopped them in a brutal fight and then left the place with Kayla. Later the leaders of the Coven and Cyber found the wounded assassins. Blood Shadow ordered Fetish to locate Kayla. She told him that Kayla passed her mark onto someone else. Meanwhile Vex killed one of the wounded assassins and read the future from his entrails. He told the Coven that Wolverine would ride their altar towards his death. Cyber was promised a ringside seat for the death of Wolverine. (Marvel Comics Presents I#133/1) - Wolverine beat up some guards at the temple of the Coven to get to the Tear of Heaven. In the hall where the tear was kept he was opposed by Fetish, Satyr and Vex. They attacked him, but he was able to defeat them. When he tried to get the Tear of Heaven Blood Shadow stood in his way and defeated Wolverine with some hard attacks on nerve clusters and vital areas. Wolverine lost consciousness and awakened next to Cyber ,who was now handcuffed to him. (Marvel Comics Presents I#134/1) - Fetish watched Wolverine and Cyber fight against each other. Blood Shadow stopped their fight by narcotizing them with gas. Wolverine and Cyber were shackled to a sacrificing altar above an acid-pool and Blood Shadow began the ceremony to start the last Dark Age of mankind. (Marvel Comics Presents I#135/1) - Cyber and Wolverine freed themselves from the altar and Satyr tried to stop them from getting away, but he was clotheslined into the acid. 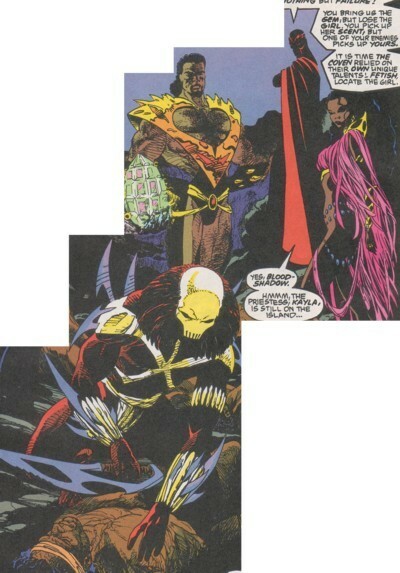 Cyber and Wolverine went through many warriors of the Coven and finally took away the Tear of Heaven from Blood Shadow. They left the temple of the Coven with it. Fetish got the body of Satyr out of the acid and began to bring him back with her magic. Blood Shadow, Vex and many warriors put wings on and flew to the Temple of the Sun where Cyber attacked Wolverine, revealing himself as an ally of the Coven. Blood Shadow tasted from the distance that blood was shed in the Temple of the Sun. Desecrated by the blood, the temple was now open to invasion from the Coven. (Marvel Comics Presents I#136/1) - Together with their leaders, the cultists of the Coven attacked the guards of the Temple of the Sun. Vex and Blood Shadow led their warriors to the room where Wolverine was fighting Cyber. Blood Shadow wanted to take Kayla with him and Wolverine attacked him like an animal. Blood Shadow wasn't able to read his mind anymore and was killed. Meanwhile Vex fought against Cyber on a bridge outside and sliced his artificial eye. Cyber wasn't impressed by this move and cut open the lower body of Vex who was now able to read his own entrails until he died. Although the leaders of the Coven (Blood Shadow, Fetish, Satyr and Vex) were calling each other brother and sister all the time, I don't think that they are each others relatives. Blood Shadow also called the attacking Coven before the final fight his brethren. I think it was like in a sect. All people involved are brothers and sisters of each other because it was a very domestic cult with a strong hierarchy (Blood Shadow as supreme leader, Vex, Satyr and Fetish as lower leaders, assassins as followers). I don't think that the Coven is done forever. Fetish survived for sure. Satyr probably survived too with the help of Fetish. Some of the warriors of the Coven could've gotten away at the end too. I think we just have to wait until this century comes to an end to see if they are really still around. The blades of Vex reminded me of Klingon weapons. I'd like to think that this wasn't the first time the Coven tried to bring the Dark Age to humanity. The Temple of the Sun looked old and the crumbling thing the Coven had as a temple looked even older. This war between good and evil on Koma Koi was probably going on for some centuries. 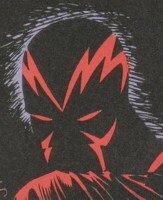 Blood Shadow was a telepath and able to predict all moves of his opponents by reading their mind. He had some advanced knowledge of the body which he showed by hitting his opponents at nerve clusters and vital areas. He was also the supreme leader of the Coven. (Marvel Comics Presents I#132/1) - He reminded Cyber of all his failures and then ordered Fetish to locate Kayla and Vex to read the future from the intestines of a beaten assassin. (Marvel Comics Presents I#133/1) - He ordered Fetish to finish Wolverine, but she failed. 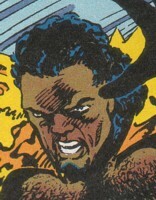 After Fetish, Satyr and Vex were defeated, he then opposed Wolverine by himself . Blood Shadow bragged about his mind reading powers and wasn't such an easy foe for Wolverine as the others were. 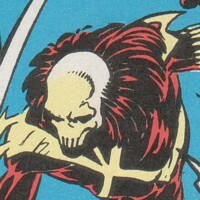 He was able to duck all attacks of Wolverine and simultaneously beat him up by hitting nerve clusters and vital areas. Blood Shadow defeated Wolverine, who lost consciousness after a short fight. (Marvel Comics Presents I#134/1) - He stopped the fight between Wolverine and Cyber by pumping gas into their cell because they were meant to become sacrifices. He let them be shackled to an altar which was lowered into acid and began the summoning of the final Dark Age. (Marvel Comics Presents I#135/1) - He ordered Satyr to stop Wolverine and Cyber when they freed themselves. Blood Shadow lost the Tear of Heaven to Wolverine in the process. Blood Shadow followed Wolverine and Cyber together with all his warriors and Vex to the Temple of the Sun like it was planned before. Blood Shadow tasted that blood was spilled in the Temple of the Sun when he approached the temple and ordered his brethren to attack because the temple was no longer able to hold them back because it was desecrated. (Marvel Comics Presents I#136/1) - He entered the room where Wolverine was fighting against Cyber and tried to get Kayla for himself. He tapped too deep into the mind of Wolverine with his telepathic powers and unleashed the animal in him. Blood Shadow was not able to read his mind anymore and was killed by Wolverine. Fetish was a clairvoyant and possessed magical powers which she used in many different ways. She was one of the lower leaders of the Coven. (Marvel Comics Presents I#132/1) - Fetish located Kayla still being on the island and told Blood Shadow that Kayla gave her sacrificial mark to somebody else. She then asked Vex what he saw in the intestines of the fallen Coven assassin and listened to his words. (Marvel Comics Presents I#133/1) - Fetish opposed Wolverine when he tried to steal the Tear of Heaven together with Satyr and Vex. She was ordered to finish Wolverine and used Flames of the Faltine to do so. Wolverine was burning and threw Vex against Fetish to stop her. It worked and Fetish was on the ground. (Marvel Comics Presents I#134/1) - Fetish watched Wolverine and Cyber fighting in their cell on a monitor. She held a remote control for the cameras in her hand. Later she stood in front of Blood Shadow when he began the ritual to summon the Dark Age. (Marvel Comics Presents I#135/1) - Fetish, Vex and Satyr were ordered by Blood Shadow to stop Cyber and Wolverine from fleeing. She got the burnt body of Satyr out of the acid after Wolverine and Cyber got away and used her magic to save his life. She now wanted revenge for the near death state of Satyr which wasn't part of their plan and asked Blood Shadow and Vex to bring the heads of Cyber and Wolverine. She stayed behind with Satyr when the Coven attacked the Temple of the Sun. Satyr had super strength and some higher degree of durability which he showed by smashing a wall with his fists. He was one of the lower leaders of the Coven. (Marvel Comics Presents I#132/1) - Satyr wanted to know from Cyber who Wolverine was. After getting an unsatisfying answer he listened to the wiser words of Fetish and Vex. (Marvel Comics Presents I#133/1) - Satyr opposed Wolverine together with Fetish and Vex when he tried to steal the Tear of Heaven. Wolverine ducked a brutal fist of Satyr that smashed a wall. Wolverine sliced Satyr with his claws which finished Satyr for awhile. (Marvel Comics Presents I#134/1) - Satyr stood around while the others watched Wolverine and Cyber fight in their cell. Later he joined the others at the ritual of the Dark Age and stood before Blood Shadow with the other lower leaders. (Marvel Comics Presents I#135/1) - Satyr, Fetish and Vex were ordered to stop Wolverine and Cyber from fleeing. Satyr jumped onto the altar and was clotheslined into the acid. He was rescued by Fetish when Wolverine and Cyber were gone. Satyr whose body was burnt by the acid released himself to the magic of Fetish. He was near death when Blood Shadow and Vex left with many warriors to attack the Temple of the Sun. Vex was an augur and was able to read the future from entrails. He used different blades in combat. He was one of the lower leaders of the Coven. (Marvel Comics Presents I#132/1) - He saw that Wolverine only wounded their assassins. He killed one of the assassins to read the future from his entrails by the order of Blood Shadow. Vex told the others that Wolverine will be their offering to the darkness and that he rides to the altar towards his death. Vex promised Cyber that he would've a place in the first row to see the death of Wolverine. (Marvel Comics Presents I#133/1) - He attacked Wolverine together with Satyr and Fetish when he tried to steal the Tear of Heaven. He attacked him from behind with his blades. Wolverine dodged his attacks and when threw Vex against Fetish when she fried him. Vex was unconscious after the fight. (Marvel Comics Presents I#134/1) - He watched Wolverine and Cyber fight in their cell from above the glass plate and told Blood Shadow about the hate he felt between them. Blood Shadow stopped the fight after Vex told him that they would kill each other soon. Vex later attended the ritual to summon the Dark Age and stood in front of Blood Shadow like the other lower leaders. (Marvel Comics Presents I#135/1) - He was ordered by Blood Shadow to stop Wolverine and Cyber from fleeing. He failed and was taken out by Wolverine. As their planned had worked out well he put on wings and flew together with Blood Shadow and many warriors to the Temple of the Sun. 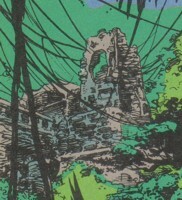 (Marvel Comics Presents I#136/1) - Vex killed a guard of the Temple of the Sun. He told him in death that they were now able to ensure a Dark Age by destroying the Temple of the Sun because it was defiled by blood. Vex entered together with Blood Shadow and some warriors the room where Wolverine was fighting against Cyber. He attacked Cyber with some warriors. Cyber drove Vex to a bridge outside the temple after killing some warriors. Vex thought he had found the weakness of Cyber and sliced his eye. He hit the artificial eye and Cyber gutted him. Vex read his own intestines in the last seconds of his life. They were the normal folk of the Coven. They were a bunch of loyal cultists whose only purpose was to fight and kill for their masters. (Marvel Comics Presents I#132/1) - Some of them hunted Kayla down the beach. They tried to kill her because she fled from them with the sacrificial mark on her. Wolverine defeated the assassins, but didn't kill them. A short time later Vex killed one of the fallen assassins to read the future from his entrails. (Marvel Comics Presents I#133/1) - Wolverine beat up more of them in the temple of the Coven. They guarded the Tear of Heaven and were no match for him. (Marvel Comics Presents I#134/1) - All surviving assassins attended the ritual to summon the Dark Age. (Marvel Comics Presents I#135/1) - They fought Wolverine and Cyber when they tried to flee. They failed to stop them from fleeing and getting the Tear of Heaven from Blood Shadow. Their spears didn't hit their targets, but it was all part of a plan. All warriors put on their wings and flew together with their leaders to the Temple of the Sun. 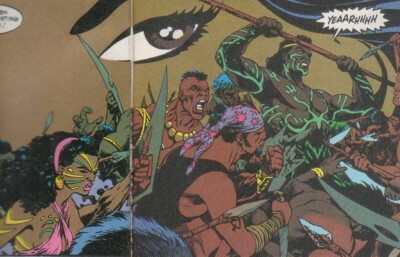 (Marvel Comics Presents I#136/1) - The assassins of the Coven attacked the warriors of the Temple of the Sun without mercy. Cyber killed some of them when they attacked him together with Vex. Many other fell through the guards of the Temple of the Sun. This was the Coven's headquarter. This was the place they made their sacrifices and other rituals. It didn't look like much from the outside, but it had some really modern stuff in the inside like a cell with a glass ceiling and cameras in it. There was also a pool of acid in the temple.